Preheat the oven to 350°F and place a rack in the center of the oven. Butter and flour a 10-by-3-inch round cake pan. In a medium saucepan, carefully bring the maple syrup to a boil over medium-high heat. Remove the pan from the heat and whisk in the 2 tablespoons butter. 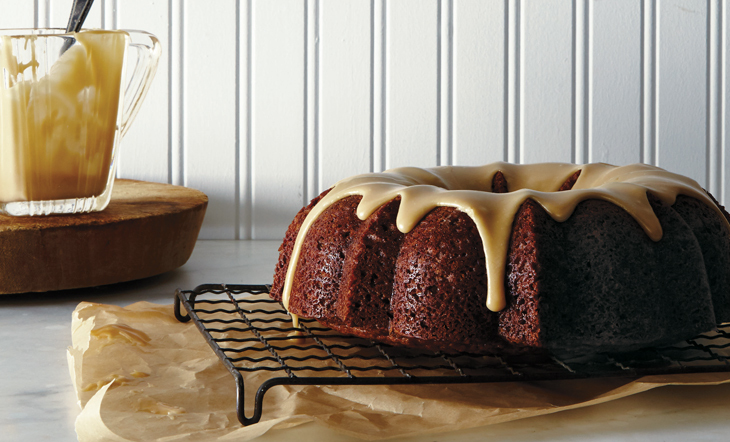 Pour the maple syrup into the prepared cake pan. Arrange the apple slices in concentric circles in the bottom of the pan, making a second layer on top of the first if they don’t all fit in a single layer. In a small bowl, whisk together the flour, baking powder, salt, and baking soda. In a separate bowl, whisk together the whole eggs, egg yolks, buttermilk, and vanilla. Set aside both bowls. Using the stand mixer or a handheld mixer and a large bowl, beat the remaining 1 cup butter and the sugar on medium speed, stopping to scrape down the sides of the bowl and paddle several times, for 6 to 7 minutes, or until light, pale, and fluffy. On low speed, add about one-third of the flour mixture and beat for about 15 seconds, or until almost fully incorporated. Add about one half of the egg–buttermilk mixture and beat until almost thoroughly incorporated. Stop the mixer and scrape down the sides of the bowl and the paddle. Add half of the remaining flour mixture and beat until almost fully incorporated. Add the remaining egg–buttermilk mixture and beat until almost fully incorporated. Remove the bowl from the mixer and fold in the remaining flour mixture with a rubber spatula just until fully incorporated. Top the apples and maple syrup with dollops of the batter and then spread evenly with the spatula to smooth out the batter. Bake the cake for 60 to 70 minutes, or until golden brown and the middle springs back when you poke it gently with your finger. Let cool in the pan on the wire rack for about 1 hour. 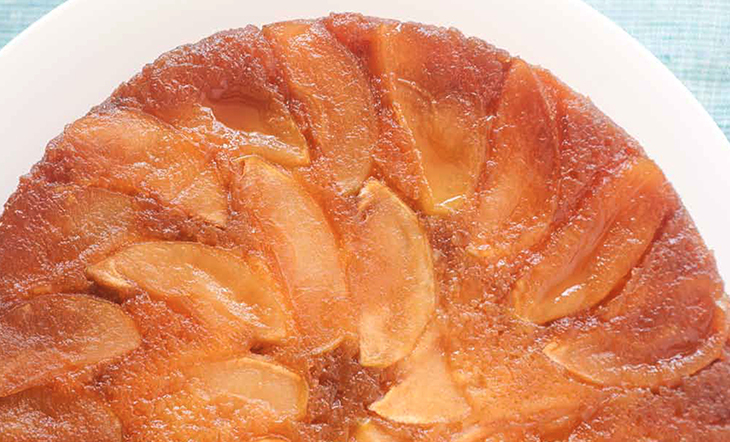 Carefully invert the cake onto a serving plate while it is still warm, so that the apples will release from the pan. Slip any dislodged apple slices back into place. Serve warm with crème fraîche, unsweetened whipped cream, or vanilla ice cream.